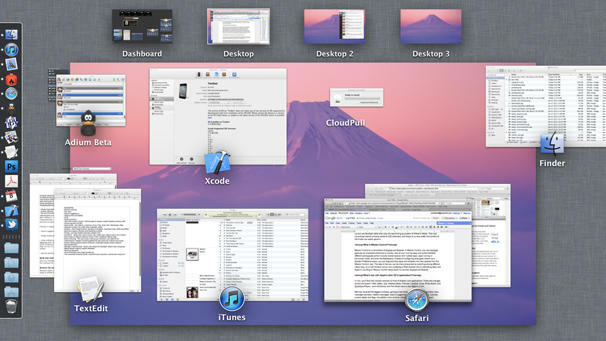 Let’s face it: The jump from Leopard to Snow Leopard held no culture shock for Mac users. As a software update, the biggest tweaks were a smaller footprint (i.e., file size), slightly faster performance and the end of Quicktime Pro. 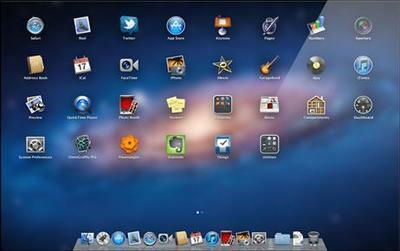 This time around, however, Mac OS 10.7, “Lion,” is pouncing onto the scene with a bevy of changes. There are revisions galore here, the most striking of which are the flecks of iOS-inspired touches, like multitouch gestures and Launchpad, a new application launch center that bears a striking resemblance to an iOS homescreen. Luckily for people who prefer a more desktop-ish experience, these can be changed or ignored, but it does make one wonder just what Apple is up to. Will the company keep mashing up its desktop and mobile platforms until they’re virtually indistinguishable? That’s more or less the future that the pundits are ruminating about, as this does seem like proof that Apple’s taking its own “desktops are over” comments to heart. But that’s a conversation for the future. Back here in the present, we’re looking at a new OS X launch. So let’s check out some of the major features and see what’s in store for us. This is going to be a tough transition for anyone who doesn’t use a touchscreen smartphone. Many of us are used to double-tapping a word to select it, or scrolling and zooming with our fingers — question is, will we like doing it on our desktops via a trackpad? Only time will tell, but in the mean time, at least we can choose to use the three-finger swipe and other gestures, customize them for different actions, or turn them off and keep our mouse. Don’t be unnerved by the missing scrollbar. It’s there; it’s just hiding. It will show up again when you mouse over it or start scrolling. The scrolling action in iOS X Lion works similar to iOS — with content moving opposite of the direction of your fingers. This “inverse scrolling” is actually a fairly natural way to navigate (so don’t over-think it). But if you can’t get the hang of things, you can change it to move the opposite way. Sidebar icons look a bit more iTunes-ish, with a simple monochromatic theme. Inside the window, there’s a new item called All My Files, which brings up every doc in the computer grouped by type. Outside, the windows are resizable at every edge, instead of just at the bottom right corner. And Finder no longer shows the status of your drive space unless you reenable it. When you leave an application with open windows or work on a doc or file, the OS will freeze or save it, just the way it was when you last had it open (even if you reboot). 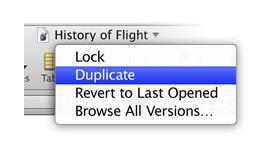 And Autosave and Versions even let users refer back to old revisions, in case you need to copy something from the past. This trio of features is like the next generation of iOS multitasking and Time Machine smushed together. Fullscreen apps go to the width of the screen and sit in a different desktop space. (If you use Spaces, this will be familiar to you.) To go into fullscreen mode, hit the upper right button of the toolbar. In fullscreen, the menu bar, dock and dock badges now hide, but these are accessible by mousing over to where they sit. (Bouncing icons, however, do pop in.) Users will be able to switch spaces via multitouch or Mission Control (see below). This lets nearby users share files wirelessly by creating a local ad-hoc network. (Basically, it means you can network with another computer, even when no other Wi-Fi network is present.) The operative word here is “nearby” — this only works up to 30 feet. 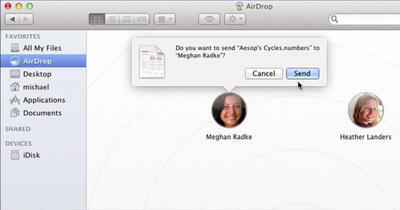 Icons representing AirDrop users in a local network show up in the Finder’s sidebar, and a simple drag-and-drop of a file onto one of them initiates transfer of the doc. From here, the user accepts or declines it. Exactly what the name implies: Launchpad lets users launch all their apps from one place. Reminiscent of an iPad homescreen, the layout uses icons, folders and scrollable pages to house the whole app list (in user-customizable order). iOS users are used to this, though anyone with a large inventory of applications will likely be sent running to Spotlight to find programs. Mission Control is like version 2 of Exposé and Spaces, allowing users to view and switch between all open apps, desktops, docs and dashboard. Designed to make good use of the trackpad, M.C. also retains keyboard shortcuts for people who just aren’t into gestures. The old version of Spaces required people to predetermine what programs open in which spaces via System Preferences. Here, they can decide on the fly by dragging and dropping them. Mail, Safari, iCal, Address Book, Preview, TextEdit, iChat, Photo Booth, Quicktime Player, Dictionary and Font Book all received some updates, ranging from minor under-the-hood tweaks to more visible changes. Mail. 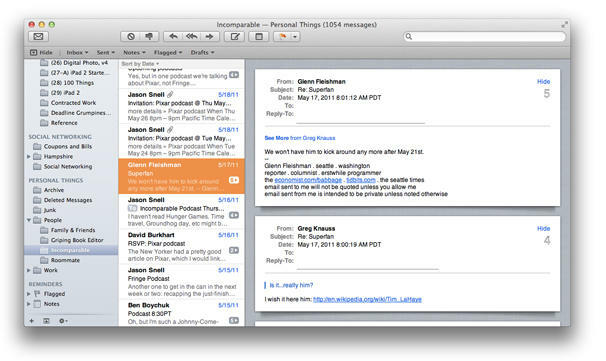 There is (finally) a three-column horizontal layout, with threaded conversation view, message previews, related e-mails, search suggestions, inline reply and deletion controls, customizable labels and flags, archive mailbox setting, and support for Exchange 2010.
iCal and Address Book both got makeovers to resemble their iOS counterparts more. Preview users got new signature annotations, magnification tools, and support for reading iWork and Office docs. TextEdit got a new toolbar. iChat received third-party plug-in support for additional IM services and a unified buddy list. Photo Booth now has a bunch of new effects, ability to trim vids and fullscreen mode. FaceTime for Mac, which first launched as a beta in Snow Leopard, has been fully integrated into Lion. This client lets you video call other Macs with FaceTime, as well as any iOS device with a front camera. It integrates directly with the Address Book, tracks recent and missed calls, flash a dock icon for missed calls — even when it’s not running. QuickTime has resurrected some features from the old QuickTime Pro version, including merging and rotating vids, saving audio only, partial screen caps, and export to Vimeo, Flickr, Facebook, iMovie and Mail. 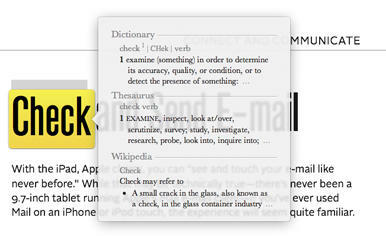 Dictionary‘s inline definitions got more integration across the OS. Now you can select and define a word via Dictionary pop-up in more places. Font Book got a little reorganization and some new system fonts, like Damascus, PT Sans, Kefa and — in a fun twist — Apple’s custom color-emoji font. 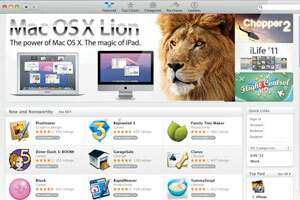 Pro: Mac OS X Lion is just $30, which is peanuts for a major upgrade. Con: No one, including Apple, sells a hard copy disc version of Lion. It will only be available on new Macs or via the Mac App Store. Pro: Recent Mac customers who purchase between June 6 and July 20 have 30 days (or until Aug 19) to download Lion for free. Customers who buy after July 20 have 30 days from the purchase date. For more info, Apple will update this page here, so bookmark it. Con: The download is 4GB. Con: Lion won’t work with all Macs. Macs from mid-2006 and earlier are out of luck. Pro/Con: Lion requires a previous install of Snow Leopard. Hopefully Apple will eventually allow for something like a combo update or an alternative upgrade path for people who are still on Leopard, but one thing’s for sure — it won’t be available at launch. Sigh. Well, at least both software versions are cheap. What do you think of Lion so far? Is Apple basically turning OS X into “iOS — the next generation”? And if so, does it work for you, or will you be sticking with Leopard/Snow Leopard a little longer?